‘A frog in the throat’ is an American phrase that entered the language towards the end of the 19th century. The expression doesn’t have a fanciful derivation (see more on that below) but comes directly from the fact that a hoarse person sounds croaky – like a frog. Now let me beg of you to learn to say NO. If you find a ‘frog in your throat,’ which obstructs your utterance, go by yourself, and practise saying no, no, NO! Interestingly, a reference to the phrase was printed just four weeks later in the English newspaper The Hastings and St Leonards Observer, in an article about ‘Yankee advertising’. The Observer journalist describes how a local chemist had adopted an American advertising window display in order to sell the imported ‘Frog in Your Throat’ lozenges. The display consisted of artificial frogs dressed up as English peasants and arranged in a variety of tableaux titled ‘Merrie England in Ye Olden Time’. In order to lend some zest to the sales campaign, the advertising agents for the importers invented a back story which claimed that ‘a frog in the throat’ was ‘an old English expression, once in common use, but now forgotten here’. 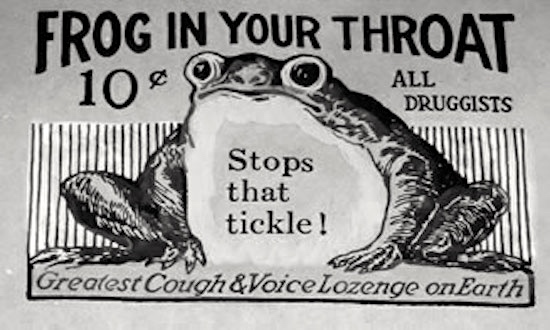 That story is as fake as the stuffed frogs – the expression is certainly American and only became widely used in England when Taylor Bros. began selling their lozenges. It is easy to find websites that claim ‘a frog in your throat’ derives from the belief that ‘in medieval times physicians thought that the secretions of a frog could help heal a sore throat‘. That’s true, they did have that belief, but any link between that and the phrase ‘frog in the throat’ is one of the pieces of folk etymology that appear to float around the Internet and enjoy apparent immortality, despite having no basis in truth and no supporting evidence. Holding a live frog in a child’s mouth until the frog died was thought, in the 17th century, to be a cure for thrush (a viral infection of the mouth). No one at the time used the phrase ‘a frog in the/your/ones throat’, which isn’t known until the late 19th century. As a general rule, any explanation of the origin of a phrase that begins with ‘In medieval times…’ should be treated with suspicion. This entry was posted on March 27, 2018 at 5:27 am and is filed under Etymythology, Idioms, Linguistics in the comics. You can follow any responses to this entry through the RSS 2.0 feed. You can leave a response, or trackback from your own site.